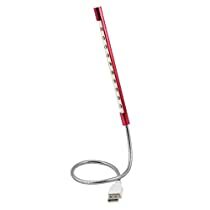 Powered by USB port with touch switch, plug and play, compatible for all the USB interface, 5V 1W, Length: 46cm, LED Head is15cm. Slim design, Desk,bed,outdoor, wherever you are, it offers convenience, flexible metal bellows can do the whole direction of rotation, free bending, adjusting the angle, flexible and convenient. For use in notebook computers, mobile power, creativity USB LED lamp night light notebook computer keyboard lights, mini shape, slim body, carry anywhere with LED lights. Bright white LED can ensure clear vision in the dark, at night or in your online gaming time, turn off the lights, plug in a USB lamp protection direct eye fatigue is not easy, but also save electricity, and does not affect the others rest, let you enjoy the fun and games of the network. Available colors are:Purple,Blue,Champagne Color,Black,Red,Silver Tone. Standard USB 2.0 plug compatible with any notebook or desktop PC that has a USB input. No external power source needed, plug it into the USB port on your Notebook or PC. Flexible gooseneck design for optimum visibility and precise lighting. The light which not only can form a complete set with USB computer socket,but also can directly set with city power supply.